Fair Food prides itself on delivering locally grown food in front of the consumer and to promoting a humane, sustainable agriculture system for the Greater Philadelphia region. Keeping the revenue stream within our region provides a sustainable and local economy. Consumers, restaurant owners, artisans, and buyers all have access to each other and homegrown products that were handled with care. Lastly, placing an emphasis back on farms creates opportunities to expand fertile land, which is getting more and more scarce. The centerpiece of Fair Food’s mission rests on the Philly Farm and Food Fest. On April 8th, 2017 The Philly Farm and Food Fest took place at the Philadelphia Convention Center and our group was tasked to provide coverage for it. This included a photo booth, interviews, B-Roll footage, and timelapse coverage. With this material, we were given the responsibility of creating a 2-3 minute feature promoting what the Philly Farm and Food Fest does for all of the different parties that are involved. We also agreed to create a 30 second social media teaser and send all of the photos we took to the people featured in them. Our approach was simple when it came to the Philly Farm and Food Fest: Get as much content as possible. That meant we had to prepare extensively. Early in the morning, we were able to strategically place time-lapse cameras to catch all of the hustle and bustle from an aerial view. 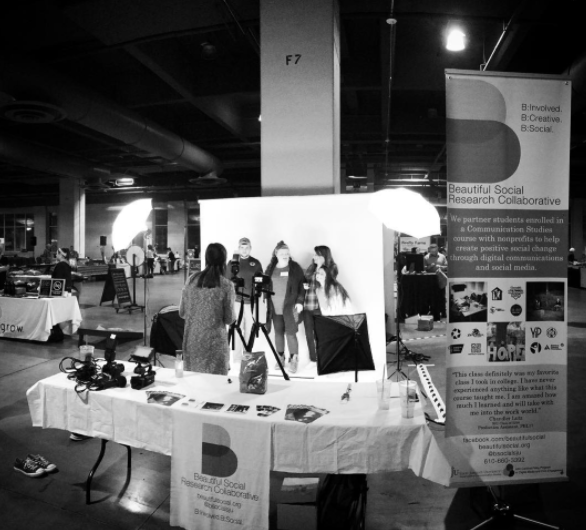 We were able to set up a dynamic photo booth which drew people from all over to it. Lastly, we did not all stay in the same spot. For the duration of the event, at least one team member was filming B-roll, conducting interviews, or working the photo booth. This allowed us to gain valuable, diverse, and multi-dimensional content. Playing with the framing or zoom added even more artistic freedom to choose what we’d like and what fit at perfect times. We were able to achieve our approach and all of the dynamic content we got easily translated to a final product. After lots of editing and refinement, we were able to create a dynamic promotional video for Fair Food’s next Philly Farm and Food Fest. Highlighting each part of the organization was successful because we had both business owners and attendees features. Also, imputing b-roll and photos from the photo booth created a very favorable commentary on the event’s overall energy. The final product was a well rounded, favorable depiction of the Philly Farm and Food Fest. We were also able to deliver every photo we took that day to the corresponding guests. With the final video made, we were also able to create a 30 second social media teaser for Fair Food to use across all of it’s platforms.